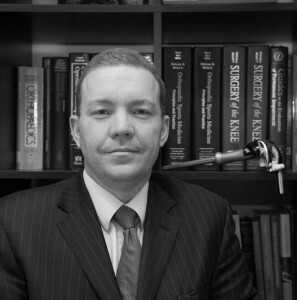 Having worked for 17 years at the Royal Bolton Hospital providing Trauma and Orthopaedic surgery services, Mr Shepard now works in three private hospitals, Beaumont Hospital in Bolton, Euxton Hall Hospital in Chorley and Gisburne Park Hospital near Clitheroe. His particular fields of interest are sports injuries and knee surgery. He regularly performs arthroscopic (keyhole) surgery of the knee, knee ligament reconstruction, meniscal and articular cartilage regeneration procedures and joint replacement surgery, both total and partial. Mr Shepard, in conjunction with a colleague, led the introduction of computer assisted knee replacement surgery in Bolton. He also regularly performs hip replacement surgery and has experience in the use of hard wearing bearings such as ceramic on ceramic for younger patients. Mr Shepard qualified from Leicester Medical School in 1990 and following his house year he taught anatomy at Leicester University for a year before entering surgical training. He trained in Leicester and Liverpool before being awarded Fellowship of the Royal College of Surgeons in 1995. He then entered higher specialist training in Orthopaedics and Trauma and trained in Liverpool and Manchester before being awarded the Intercollegiate Fellowship in Trauma and Orthopaedics in 1999. He was awarded his Certificate of Completion of Specialist Training in 2001 and was appointed as a Consultant in August 2001. During his training Mr Shepard undertook several travelling fellowships to Boston, Denver and Adelaide to work with acknowledged world experts in aspects of knee surgery. Mr Shepard attends and presents his research at local, national and international conferences. He is a member of the BASK and ESSKA, the national and European societies of knee surgery. Mr Shepard was appointed as one of the sports orthopaedics consultants to the Commonwealth Games in Manchester in 2002. He has provided orthopaedic surgical services to professional football clubs in the northwest of England. His interest in joint replacement led to him becoming an evaluating surgeon for both a minimally invasive partial joint replacement and for a system for revising failing total joint replacements. He has taught total joint replacement to junior surgeons in a course that includes live video-link surgery and minimally invasive partial joint replacement to fully qualified surgeons. Mr Shepard was a keen sportsman and has played rugby, football, squash and badminton. He represented his University at sailing and his medical school at football. Although injuries have stopped his involvement in contact sports he still enjoys racquet sports. He is married with two children and they are all regular attenders at Anfield.